The last couple of years I have been after my wife to hike Mt. Washington with me. I had not hiked it since I was a teen and it seemed like a good idea. She, however, did not share my enthusiasm and as a retort, purchased the book “Not Without Peril” for me to read. This book describes in excruciating detail all the people that have died on the mountain in every month of the year. Most people know that Mt. Washington has some of the worst weather in the world, and that it deserves a great deal of respect. Despite tremendous search and rescue teams,since 1849 there have been 137 deaths among those trying to reach the summit. Each year there are a lot of close calls, serious injuries and typically a few more deaths. The mountain is even listed in a popular blog (www.gearjunkie.com/worlds-10-most-dangerous-mountains) as one of the 10 most dangerous mountains in the world, mostly due to its unpredictable and extreme weather. According to the Mount Washington Observatory website (www.mountwashington.org), due to the fact that the site is within a day’s drive of 70 million people, the summit receives a quarter million visits per year. Only a relatively small number actually hike; most drive to the top, take a shuttle bus or the Cog Railway. Most who visit the summit each year experience no problems whatsoever. Yet each year several “close calls” accentuate the dangers of the mountain. Danger and death can occur for many reasons on the mountain, but generally involve ill-prepared hikers, skiers and climbers. Others are just accidents, with injuries sustained by slips, falls, falling ice, rock slides, avalanches, rushing torrents, etc. While the main causes of death are falls, hypthermia and natural causes (men and women of any age not as fit as they thought), people have died from car, carriage, slideboard, railroad and 10 from airplane accidents. Five people died from drowning in raging mountain streams. You must be in pretty good shape to make this trek, and reasonably well prepared. I found out that another man who was about my age had a heart attack on the same trail the day after we went. He was out with his two daughters; one stayed with him, the other went for help. Sadly he did not make it. Now I am often accused of not only looking for adventure and challenges that may not befit my age, but looking for partners that I can convince to do them with me. I am no reckless daredevil, but generally feel that I am fit and brave enough to do anything a few levels below Evel Knievel. Luckily my kids mostly share my desire for adventure, and will gladly join me as time and money permit. 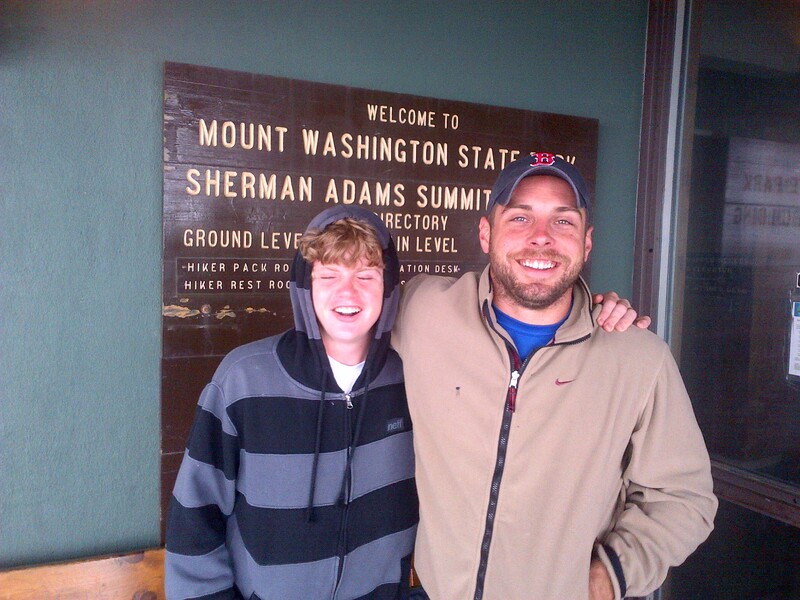 Such was a trip in August with my two sons to the summit of Mt. Washington on the Tuckerman Ravine trail. We wanted to go up and down as fast as we could, and scout out the headwall for a possible ski trip there next Spring. Although our trip was in August, it was cold and rainy at the base the morning we headed out. After breakfast we signed the registration book and ventured onto the Tuckerman Trail. We were not 15 minutes out when we came upon a group that was heading back in, having decided that it was too miserable and possibly dangerous to continue that day. Having come all that way, we did not intend to quit do to rain and slippery rocks, but were a little more wary. The lower part of the mountain was not that steep, though it was challenging to walk up the slope on slippery rocks while keeping a good pace. With the ever-present threat of worsening weather on this mountain, there is always a certain motivation to keep moving rapidly. By the time the first hour was behind us and the headwall was in site, amazingly we were blessed with sunshine which was not in the forecast. When we got to the steeper parts, the rain came back and we had really slowed our pace. I was a little worried about my 14 year old son, since he is not always the most cautious and there are several places where you can fall hundreds of feet. Happy To be at the Summit! The terrain at the higher elevations of the Tuckerman Ravine Trail is like a rock graveyard, with nothing but large slippery rocks and small rivers of water charging down the mountain. Foggy as it was, we needed the sturdy cairns to mark our way. It is easy to get lost, and had to keep reminding ourselves to focus on these old markers. It took us three hours to walk up in bad conditions, and about 2.5 hours to hike down. (Soaken wet and cold at the summit, we were tempted to take the shuttle back.) It was a good workout, and by the time we were almost back were were starting to stumble on the slippery rocks. It was a little easier than I remembered, but my muscles let me know I had worked hard for the better part of a week. I could barely walk up stairs for several days. Since Mt. Washington is also home to the highest number of heavy cloud days per year in the continental US (244 on average), our chances for a panoramic view of the valley was slim. Sure enough, when we got to the top, it was if we were in whiteout snow conditions. We could not see the buildings that were right in front of us due to heavy clouds and fog. I have been to the top when there was a nice view, and it is much better than seeing nothing but fog. Still, it is pretty cool up there when you can’t see anything!